I spent an afternoon with Kiro Kirov (87 at the time) searching almost every store in the Bulgarian city of Plovdiv for his favourite ice-cream. After a few hours of driving, looking for a car park, and passing through aisles of multiple shelving units with goods and products, we finally found it; a 500 ml roll of pinkish raspberry and brown chocolate ice cream, lying in a banal translucent plastic box. – A motion-related event having the potency to stretch our cognisance about the concrete and the potential; the utilitarian and the non-pragmatic; the dreamlike and the actual; the physical, virtual, and augmented realities. What is it, I thought, that provoked Nancy M. Johnson to invent and patent the hand-cranked ice-cream freezer in 1843 – an invention that is still in use today? It was a historical shake-up related to the control of the state of water and matter in untypical geographical and atmospheric conditions. Shortly after we caught the ice-cream, I found myself at his one-bedroom apartment, located in a rundown part of the city. The living room functioned as a permanent ‘exhibition’ space – two tables, a sofa, handmade shelves – all covered with hundreds of 1:100 scale model wooden airplanes, referring to different historical periods and parts of the world. The bedroom, his actual workshop, was characterised by a single bed with a nearby handmade small working desk under a relatively large two-section window; an organised chaos of tools, materials, and scale drawings of aeroplanes, helicopters and boxes containing their hand-made parts. Following the introduction of his working-living place, on the way to the kitchen, Kiro had a short ‘chat’ with several spiders referring to them as his friends who protected the house from flies. We ate ice-cream, drank low-alcohol beer and told each other stories until after midnight. His and my peculiar curiosity imperceptibly leapt our conversation towards the space encompassing ice-cream of various types and quality as well as distinctive interconnections within aviation’s past and present. His first personal encounter with aviation was at the beginning of WW2. He and his friends would play by pushing around a small postal plane that made an emergency landing in the fields close to the Radomir railway station. In early 1945, in light of the 1914 alcohol ban on its ships, the US Navy started introducing ice-cream and commissioned the world’s first floating- ice-cream-parlour for service in the Western Pacific. The parlor was a refrigerated concrete barge, built at the cost of over one million dollars, with the capabilities of producing 37 litres of ice cream every seven seconds. Simultaneously, sugar shortages prompted a propaganda campaign, encouraging children not to eat ice-cream. In 1945, right after the end of WW2, a giant balloon, filled with helium and shaped like a giant ice-cream cone, the biggest in the world at that time, was displayed in the Macy’s Thanksgiving Parade in New York City. After showing me a box full of his leftover ice- cream sticks (he was making some of the model’s parts out of them), Kiro told me how his collection started. While landing after flying with a hand glider, Kirov broke his arm. The incident left him grounded for a while, and during this period he began making wooden models of all the aircraft types he had piloted. What struck me the most during our first meeting was the poetic self-assertion expressed in every aspect of Kiro’s practice. He had a distinct language, both visual and performative, through which he expressed his obsession with flying: here aviation was an intensely personal world, an entire aesthetic, existing in parallel with the four subsequent socio-cultural periods in Bulgarian history – before, during, and after WW2, the establishment of the Communist regime, and the period immediately after the end of the Cold War. Apart from the different topics and stories we tackled at one point or another in a number of conversations, he shared his dream to have one last solo parachute jump. We started working on it right away and eventually, considering his age, the only option possible turned out to be a tandem jump. In August 2014, we took a three-hour train trip from Sofia to a small airport near the town of Boychinovtzi. On the next day, we boarded a 35-year-old An-2 airplane. At 3000 m altitude, Kiro jumped and immediately vanished into the air. For a while, I watched and contemplated, harnessed securely, through the open door of the airplane. 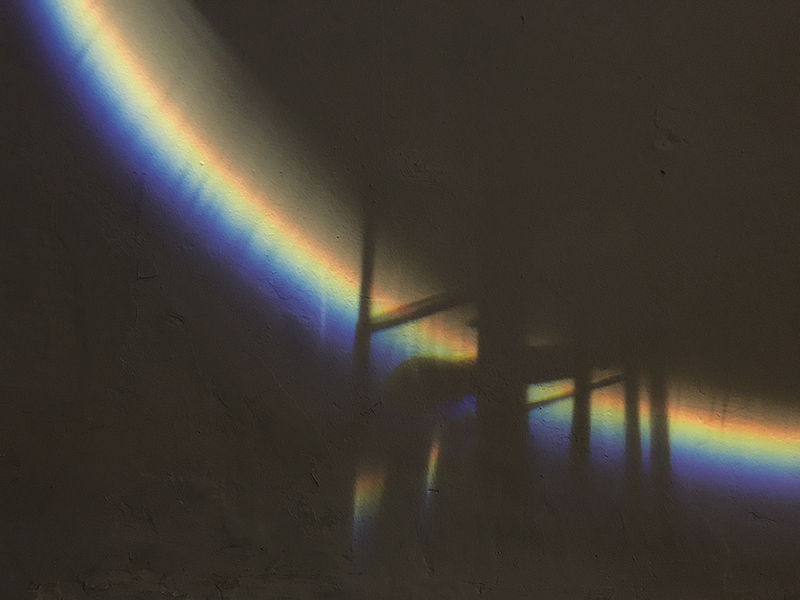 As the plane spiralled downward, preparing for landing, I saw its shadow slide over the ground and the clouds – then suddenly a bright rainbow encircled the shadow: it was the first time I was witnessing what was known as Broken Spectre. At the beginning of the First Industrial Revolution in the 1780’s the German Lutheran pastor and natural scientist Johann Silberschlag, who frequented the Harz Mountains, observed and made the first known description of the ‘Broken Spectre’. Not long after Silberschlag’s observation of this natural phenomenon though, the development of manned and unmanned modern balloons and aircraft began to expose their spectres and change the perspective of experiencing the same particular phenomenon. The first recorded manned flight in modern times was made on 21st of November 1783 in a hot air balloon built by the Montgolfier Brothers. Later, in 1784, in a modified version of the first balloon, they took off from Paris. The balloon flew north at an altitude close to 3,000 metres, above the clouds, travelling a distance of 52 km in 45 minutes. The first recorded use of such a device from aboard a ship occurred in 1806, almost 100 years before the Wright Brother’s powered flight at Kitty Hawk in December 1903. In parallel, Alexander Graham Bell conducted that extravagant, for their time, experiments with unmanned kites and tetrahedral airplanes. On 22nd August 1849, while Austrian forces blockaded Venice, Austria used about 200 unmanned balloons each one carrying 33 pounds of explosives with half-hour time fuses, which were launched into Venice on that particular day. Further development of the aviation, during the Industrial Revolution, reversed the experience of the physicality of the space from those being aloft to those on the ground. The pre-industrial concepts of flying were often imagined as a prosthetic extension of the body that aesthetically and functionally could fulfill the gap between desire and ability. One of the first clashes between dreams and abilities that I experienced was when I was 6. I shared with one of my schoolmates the idea of jumping from the top of the large and tall wardrobe in his home dressed in a white plastic shopping bag, which was supposed to serve as a ‘parachute’. Besides the joy and excitement from the feeling of the blown-up/expanded ‘parachute’, I ended up with my left arm broken. Shortly after I started making gliders. On the way back from the airport near Boychinovtzi he told me about his own wingsuit – the first such device in Bulgaria, designed and made by him using basic military tarpaulin. He had a dozen jumps in the mid-50s in this suit, and he got excited about the idea of reconstructing it within the frame of the project. Franz Reichelt was an Austrian-born French inventor who made a living as a tailor but spent most of his time working on a flying parachute suit, designed to be worn by airplane pilots. When Reichelt was working on his design the airplane was still a relatively new invention, and the ways in which a pilot could escape a damaged plane were still being worked out. For instance, during WWI the average life of British pilots was 11 days. Reichelt’s first tests were with dummies and were successful enough for him to test the suit himself. On February 4, 1912, a large crowd gathered at the foot of the Eiffel Tower to witness the historic test. To capture the jump, a cameraman climbed the Tower with Reichelt. The 187-foot fall from the lower level of the tower killed the “flying tailor” instantly. Technology as “useful knowledge” is still widely controversial. Emotional experience of something, predominantly associated with visual language, reveals psychological perspective, which progressively depends on technology and strongly deviates the process of communication. Hence, does Technology present understanding of events? Does particular information, sent and received through Technology, represent the actual? As the technologies related to military aviation developed, the images began representing less and less the record of a particular event and started capitalising on them. Photography/moving images and aviation developed alongside each other. They occurred as products of late 19th-century technology and imagination. Aviation films have been used to create a colonial, totalitarian and national image and to promote technological achievement and socio-political endeavours. In the first decades of the 20th century, American flight schools admitted neither women nor African- or Native Americans. Such a context provoked Bessie Coleman from Chicago to go to Paris on 20th November 1920 and to become the first woman of both African and Native American descent to hold a pilot’s license. The development of aviation between the Wars and its contribution to the rise of Italian fascism was led by Gabriele D’Annunzio. In 1933, Chicago became the scene of a show ‘performed’ by D’Annunzio’s ideological pal Italo Balbo (who later died in a plane crash in Libya) and his armada of 24 seaplanes – a visit that created a media stir in the United States. Every doctrine swears that it can breed men, but none can tell us in advance what sort of men it will breed. Men are not cattle to be fattened for market. In the scales of life, an indigent Newton weighs more than a parcel of prosperous nonentities. All of us have had the experience of a sudden joy that came when nothing in the world had forewarned us of its coming —a joy so thrilling that if it was born of misery, we remembered even the misery with tenderness. The imaginable in dreams is symbolic, but the perceptions of wakefulness have a symbolic import that in certain ways are essential for the perception to have any sense. One of the enthralling aspects of movie cameras capturing images is that they can create a slow or, more precisely, extended time-space experience in which the spectator’s perception is naturally distinguished. Here, the role of the spectator can affect the way we are involved, or invited to act, on the distant others. I thought Kiro had never been interested in aircraft as machines, but as means for being aloft and experiencing the physicality of space. He never produced unmanned aircraft for his collection. But he has made a model of a Japanese aéroplane-bomb1 – a one-way manned flying machine. For the project’s purposes, I provided him with a set of technical drawings and commissioned two military drones2, in 1:20 scale, something that was not part of his collection until that moment. On November 8th, 1898, Tesla obtained a patent for the remote control, for which he had applied four months earlier on July 1st. Not long after, in 1916, The Bug will appear. And in the late 1930s, the Radioplane Company developed a series of radio-controlled model airplanes as aerial targets for training by the US Army Air Corps. Unmanned aircraft systems were developed simultaneously. In the 40s German airplane crew members would learn to control the Henschel Hs 293 guided bomb in a simulator. By the WW2’s end in 1945, California’s Radioplane Company produced almost 15,000 radio-controlled “drones” (UAV). Ever since that time the human eye has been becoming less insignificant. The Earth and Space Surveillance, as a materialized high-tech Panopticon, no matter where we are, impacts us and our surroundings. There is now a development of the blueprint and the expenditure of military and civil aircraft (the overlapping of the drought zones – aridity isohyets line – and the most drone-monitored and targeted areas in the world, for instance); government and corporate surveillance and space programs on one hand, and the individual practices and personal experience of people, who are radically pushing the boundaries of being aloft, like Kiro Kirov’s life and activities, on the other. What fascinates me the most is the shift in the concept of being aloft. In the past, that was a form of imaginary experience for the firmly grounded humanity. On the cusp of and throughout the first industrial revolution, the obsession with the construction of a flying apparatus as a prosthetic extension of the body provided the new and until then un-experienced condition of being in the air. Nowadays, at any given moment, approximately one million people are aloft. The commercial flights are no longer providers of flying experience. Over the past century, the very experience of flying has shifted once again – from those in the air to those on the ground. The virtuality of the experience is no longer the result of our dreamy imagination, but rather a sub-product of the machine representation of a relatively simultaneous or past event. * Kiro Kirov was born in Radomir, Bulgaria, in 1927. He was a member of the National parachute jumping team, with which he won many international and world championships. After WWII, he became a central figure in parachuting in Bulgaria designing the first wing-suit in the country in the mid-1950s. He started his collection in the early 1980s, creating first models of the aircraft he had flown on, and since then reproduced a significant number (close to 500) of models from aviation history.